"A Code for Classifiers: Whatever Happened to Merrill's Code?" A Code for Classifiers: Whatever Happened to Merrill's Code? This is a preprint of the article published in Knowledge Organization 31 (3): 161-176. The work titled "Code for Classifiers" by William Stetson Merrill is examined. The development of Merrill's Code over a period of 27 years, 1912-1939 is traced by examining bibliographic, attribution, conceptual and contextual differences. The general principles advocated, the differences between variants, and three controversial features of the Code: 1) the distinction between classifying vs. classification, 2) borrowing of the bibliographic principle of authorial intention, and 3) use of Dewey Decimal class numbers for classified sequence of topics, are also discussed. The paper reveals the importance of the Code in its own time, the complexities of its presentation and assessment by its contemporaries, and itâ s status today. 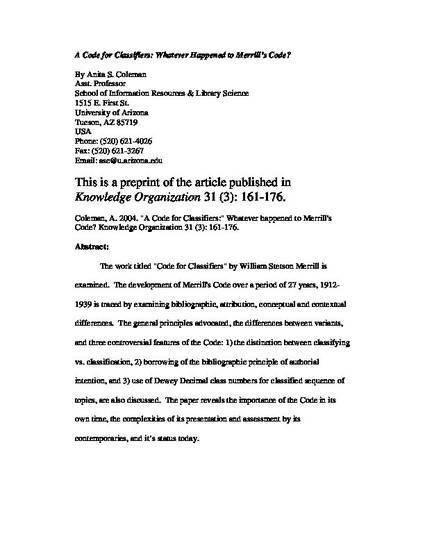 This is the Submitted Manuscript of an article that appeared in Knowledge Organization, volume 31, issue 3, 2004.